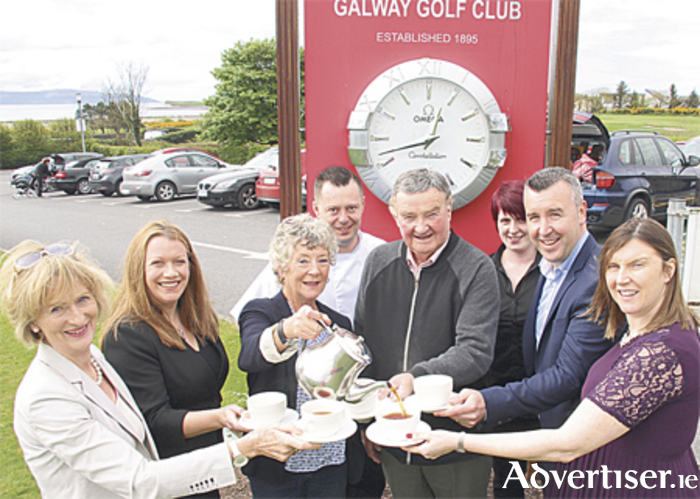 On Wednesday May 3, Galway Golf Club will host a Tea Day for Western Alzheimers. Last year the club raised more than €16,000 morning, and it is hoped much needed funds for this charity will be raised again. Western Alzheimers provides care to families affected by Alzheimer’s disease in the western region. Supporting hundreds of families with a home from home philosophy, the service includes in-home support – where care assistants spend time with the person suffering from Alzheimer’s disease in their own home to cook a favourite lunch, play cards, say prayers, or simply lend a fresh ear to stories from a bygone day. It also supplies day care in the St Francis Homes, Galway, Maryfield, Athenry and Marian House, Ballindine. All funds raised from the Tea Day will help Western Alzheimers to provide its services which will ensure people suffering from Alzheimer’s disease are cared for in a safe and comfortable environment and will assist families to look after their loved ones at home for as long as possible. A super-draw will take place during the tea day when Mayor Noel Larkin will be at Galway Golf Club to draw the tickets. The raffle prizes are sponsored by Sherry Fitzgerald, Roisin Dubh, The Kings Head Bistro, Renvyle House, Galway Bay Golf Resort, and Ard Bia Restaurant. Tickets for the raffle are available from Colleran’s Butcher Shop, Mainguard St and DNG Maxwell, Heaslip, and Leonard, Francis St.
All are welcome to Galway Golf Club on May 3 from 10.30am to 12.30pm where tea, coffee and delectable goodies kindly sponsored by Galway Golf Club restaurant will be served. Western Alzheimers provide a wide range of services across the counties of Galway, Mayo, and Roscommon which includes residential respite care, day care, in-home support, long-stay residential care and counselling and information service. Page generated in 0.1750 seconds.